With designer Randy Heller out of action for his parent's 50th anniversary, Bitter Woods fell from the Century ranks. We had 14 participants in the tournament. Rich Ogata triumphed over a strong field to win the wood. In the first round, the seven victors were Rich, Doug James, Michael Mitchell, Tom Gregorio, Bruno Sinigaglio, Forrest Pafenberg and Chris Roginsky. The second round saw victories by Rich, Bruno and Michael, with Tom receiving a Bye. Michael prevailed over Bruno and Rich defeated Tom in the semi-finals. All told, there were 7 German and 7 Allied victories in the tournament. 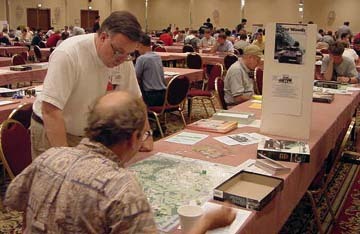 Tom Gregorio reports on his semi-final game with Rich Ogata: "The critical battle was my 19PM attempt to take Parker's Crossroad: I had 88 factors including a 4 arty unit bombardment against three US full strength defenders and a leader. I shocked only one of them (ERs 4,5,5) and thus needed a 1D4. It was a 6-1(-2) and I needed a DE or a 1D4. I got a D4 and that was the game. (We subsequently determined that I'd have been able to hold the other three VPs.) "
Rich also reported on this game: "An early breakout by 7th Army was barely contained, with only the allocation of both air units on 17PM saving the fort in Bastogne. A pair of D4s southwest of Eupen allowed the Germans to move adjacent to the town and threatened to surround it, but the town was reinforced and held throughout the game. A critical bridge failed to blow south of Trois Ponts on 18PM, leaving the town exposed and in danger of being cut off. A key engaged result in the subsequent battle for the bridgehead saved the day for the Allies. By the end of 19AM, the Germans had scored two points by preserving their mechs and destroying Allied units (19 losses, including 7 on the 19AM turn!). With their remaining forces, the Allies were able to harden all of their positions, with the exception of Parker's crossroads and one of the Ourthe River bridgeheads. The bridgehead defense was particularly precarious, with no units actually occupying the bridgehead hex itself. Parkers crossroads was garrisoned with two regiments of the 82nd and the 7/CCR regiment, plus Ridgeway. The Germans cleared the defenders in front of the Ourthe bridgehead, allowing Manteuffel and the Lehr/130 to take the bridgehead during reserve movement. The Germans mounted a massive attack of 88 factors plus four bombarding artillery on Parker's crossroads and managed to shock one of the defenders. The subsequent 6-1(-2) attack had a 1/3 chance of success, but the Germans rolled a D4 and failed to clear the last step of defenders, giving the Allies the game. Post game examination showed that the Allies would have had one final shot had the attack on Parker's Crossroads succeeded, via a counterattack on the Ourthe River bridghead. Calculation of the odds and a die roll showed that the Germans would have held their ground." The opening German result provided mixed results, the highlights being an advance across the Our river against the 28/110, and a D2 result against 14AC resulting in the entrapment and immediate surrender of the 106/422. The Allies suffered heavy attrition across the board on 16PM, with several FF and 1Dx results coupled with the loss of regiments of the 2nd and 99th infantry in the North. The Germans continued to inflict losses on 17AM, one of the keys being the elimination of an Allied artillery unit on a FF result when the Lehr Recon managed to infiltrate next to it, setting up an attack and advance to Vielsalm by the rest of Panzer Lehr. An important D4 result against a screening unit allowed Peiper to use his special move and attack the artillery defending Stavelot. A D3 result blew the artillery back, leaving Peiper with 12 hexes of daylight, and the Allies decided to concede the game."